I’m sooo sad this Rebecca Taylor top is sold out already! I was saving it to wear for this trip, but it seems I’ve waited too long. I’ll definitely let you guys know if it comes back in stock! 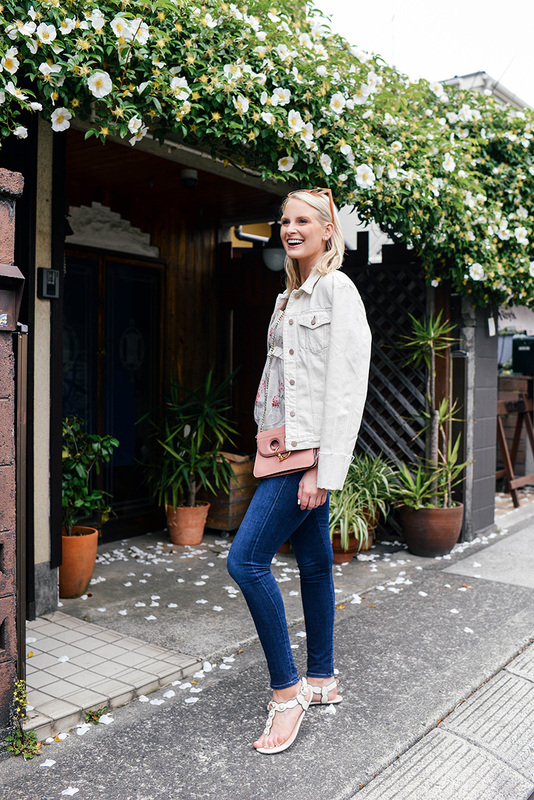 The other new item I’m excited to chat about in today’s post is this ecru denim jacket. Since picking up this oversized denim jacket at the end of February, I’ve been obsessing over jean jackets. I’ve never loved the look of the fitted denim jacket on me for a few reasons: 1) they’re usually cropped, 2) they give off a somewhat preppy vibe, 3) they’re just not that flattering on a larger chest. After trying a few different styles and silhouettes this spring, I’ve decided that it all comes down to the fit. I find an oversized look to be a little more relaxed as opposed to buttoned up and preppy with a fitted jean jacket. That’s why when I ordered this ecru jacket, I sized up to a large. The description lists it as a slim-fit jacket, and to avoid that fitted feel I wanted to size up enough so I could wear it on or over my shoulders. It’s awesome! 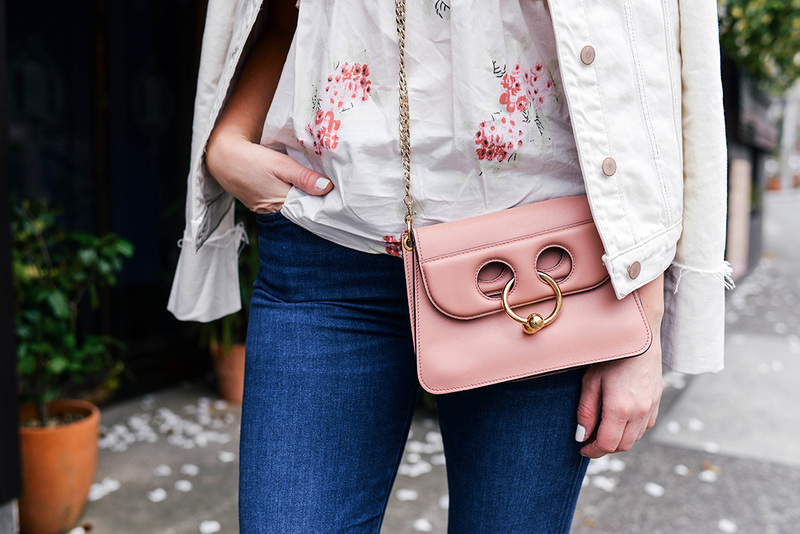 I love the way it looks with dresses and jeans alike, and this ivory color is surprisingly versatile in my wardrobe (as someone who wears white a lot!). 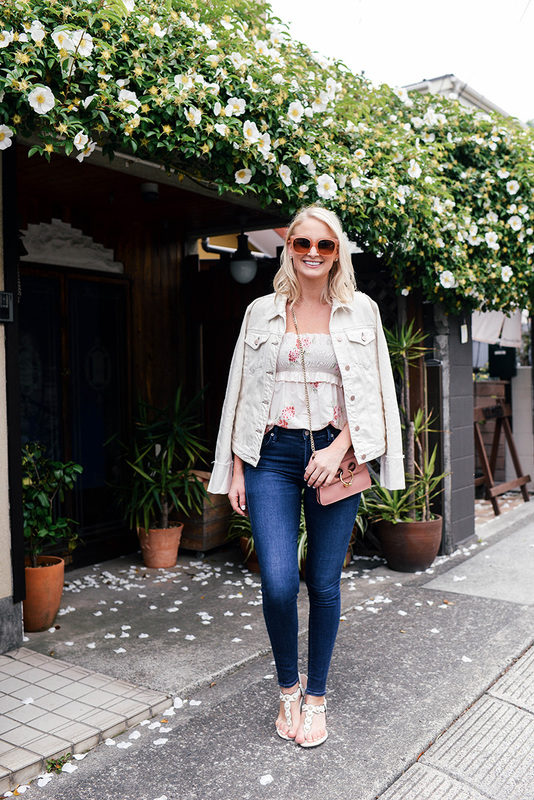 If you’re on the hunt for a jean jacket of your own for spring/summer, I’ve rounded up some of my favorite styles below! This is the oversized NEED jacket I have, I just own it in a different wash! It’s been such an excellent travel staple as it truly goes with anything and everything. If you like your jackets a little longer, don’t miss this under $100 style. 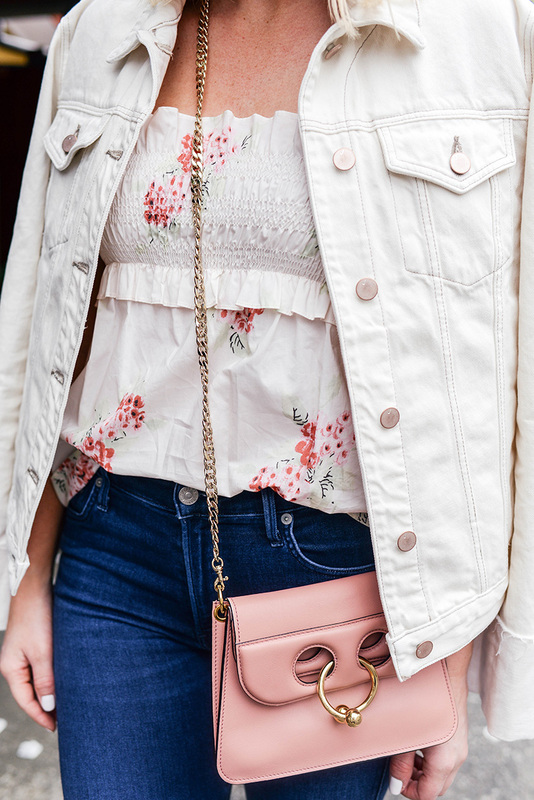 Add some color to your jacket collection with this begonia pink piece! Loving the boxy look of this River Island jacket! For something more simple and very budget-friendly, try this $53 find. Like a more feminine touch? Don’t miss this embroidered jacket. It’s so freaking cute! This oversized denim jacket comes in three different washes and is under $100! I really need some Rebecca Taylor pieces in my life, this top is so pretty. That top is really pretty and I love that jacket too!